Standing Guard | Pony Ornaments Figurines | One Price Low Flat Shipping! 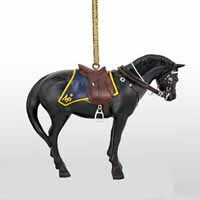 From the Trail of Painted Ponies Holiday Ornaments Collection, RCP Standing Guard Ornament. Designed by artist, Fabienne Leydecker. Made of hand-painted resin. Measures 2.75" tall. Packaged in collectible tin container. The Royal Canadian Mounted Police (RCMP) have proudly served Canada and its people since 1873. This colourful tradition continues with a spectacle known around the world as the Musical Ride. In keeping with tradition, the Musical Ride is performed by a full troop of thirty-two riders who are first and foremost police officers, along with their awe-inspiring horses. The Musical Ride consists of a stunning variety of intricate figures and cavalry drill, choreographed to music. Standing on Guard is a tribute to the Royal Canadian Mounted Police and the Musical Ride, where months of training and practice make horse and rider one.